“And we know that all things work together for good to those who love God, to those who are the called according to His purpose. For whom He foreknew, He also predestined to be conformed to the image of His Son, that He might be the firstborn among many brethren. Moreover, whom He predestined, these He also called; whom He called, these He also justified; and whom He justified, these He also glorified” (Romans 8:28-30, NKJV). 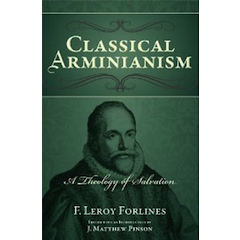 As I have done for the last several posts, once again, I lift up F. Leroy Forlines’s book, Classical Arminianism: A Theology of Salvation up to you. As I have read closely each page of the work so far, I have been encouraged by Forlines’ work and his gargantuan effort to produce a systematic theology that Reformed Arminians can embrace as their own and pass down to future generations. Make no mistake: I wholeheartedly believe that the theology of James Arminius is one that should not stop with me and current Arminian believers...but one that should outlive you and me. We should preserve this work so that, in years to come, future generations will know that the divine sovereignty/human responsibility debate has been solved...and the answer is found in Reformed Arminianism. “Calvinists have sometimes thought that this verse guarantees that everyone who is called will respond, everyone who is called will be justified, and everyone who is justified will be glorified” (F. Leroy Forlines, Classical Arminianism: A Theology of Salvation. Nashville: Randall House, 2011, pages 149-150). The key word in the above quote is “guarantees.” This word is a summation of Calvinism. It is a “guarantee” theology: everything is done, sure, and necessarily so. In the Calvinist system, everything is automatically ensured. This comforts many who believe that they are of the elect; but what about those who are reprobated? If some are elect, what else can the rest be but reprobates? If one accepts guaranteed election for the elect, he or she must also accept guaranteed reprobation for the reprobate. You cannot have one without the other. And yet, within the chapter itself, there are verses that seem to go against this notion of “guaranteeism.” Why does Paul tell the believers, “for if you live according to the flesh you will die” (Rom. 8:13), if eternal life is “guaranteed”? Why does Paul say that believers will be glorified “if indeed we suffer with Him” (Rom. 8:17), if everything is guaranteed? Why are believers told to wait for their salvation hope “with perseverance” (Rom. 8:25), if eternal life is guaranteed? Why are all these conditionals located within the first 25 verses, if verse 30 is to override all of these statements? If verse 30 provides a guarantee, and these verses provide conditions (possibility), is this not a contradiction? If someone tells you, “you’re guaranteed this job,” and then turns around and says, “you’ll get the job if you do such and such,” has that person not contradicted themselves? If the job is guaranteed, why meet the conditions? Someone may say that the conditions should be met because the job is guaranteed, that meeting the conditions further guarantees the job...but that is beside the point. For something to be guaranteed means that no conditions need be met to receive it. So if a person says, “there are no conditions to get the job,” and then turns around and says, “Oh, but there are conditions,” has this person not contradicted themselves? If Paul provides conditions for glorification, then turns around and says, “oh, but it’s guaranteed,” does that not make Paul out to be contradictory? Worse yet, does that not make the Scriptures out to be contradictory? Even worse, does this not make the Bible, the infallible, inerrant, inspired Word of God out to be contradictory? And last but never least, does this not oppose God’s nature? Does this not go against the God who “cannot deny Himself” (2 Tim. 2:13), whose Word is truth (John 17:17)? “St. Paul does not affirm, either here or in any other part of his writings, that precisely the same number are called, justified, and glorified. He does not deny that a believer may fall away, and be cut off between his special calling and his glorification, Romans 11:22...He only affirms that this is the method whereby God leads step by step toward heaven” (John Wesley, quoted by F. Leroy Forlines, Classical Arminianism, page 150). Romans 11:22 provides immediate context and evidence for the genuine possibility of apostasy. Paul tells the Gentiles, “you stand by your faith,” and says that if they do not continue in God’s kindness, they too “will be cut off.” It is not guaranteed that the Gentiles will remain in God’s kindness; in the same way, it is not guaranteed that the Jews will remain in God’s wrath: “And they also, if they do not continue in unbelief, God is able to graft them in again” (Rom. 11:23, NKJV). What does it mean to be “cut off” from the vine? And what does it mean to be “grafted in again”? To be cut off from the vine is to be disowned from the people of God (see Genesis 17:14; Exodus 12:15, 19, etc.). In the context of Romans 11, to be cut off leads to a hardening of heart, which is what the nation of Israel was experiencing as a direct result of their unbelief (Rom. 11:25). And Israel’s partial hardening means that, while the majority of the nation is headed towards spiritual death, she is not “completely” hardened; each living Israelite can turn to God and be grafted into the people of God once again. “There is parallel with words of Jesus when He said, ‘For the earth yields crops by itself: first the blade, then the head, after that the full grain in the head” (Mk. 4:28). The process that is followed from the appearance of the blade until the grain is fully developed is stated, but Jesus does not guarantee that, once the blade appears, in every case all of the other steps follow. In some cases, the stalk of grain dies before reaching full development” (Forlines, Classical Arminianism, page 150). This is confirmed by the Parable of the Sower (Matthew 13, Mark 4, Luke 8). In each account of this Parable, there is the seed that is sown on “rocky soil,” that “hears the word and immediately receives it with joy; yet he has no root in himself, but endures only for a while. For when tribulation or persecution arises because of the word, immediately, he stumbles” (Matthew 13:20-21). The text says that the rocky believer “endures only for a while.” The text does not say that the rocky believer “never endured,” or “was never planted to begin with”; rather, the text says that this type of believer “endures for a while,” and when persecution comes “because of the word,” this believer falls away. The question I pose to people often is, “how does the person experience persecution ‘because of the word,’ if they were ‘never saved to begin with’?” I’ve asked Calvinists and four-point Arminians alike to explain these verses...to no avail. I’ve never gotten an answer. In the world of theology, people are quick to give answers if they have them. The fact that Professor Forlines, Dr. Matthew Pinson, nor I (nor any other five-point Arminian) have been given answers on this question testifies to the fact that there are no other adequate answers to explain these verses. If one does not take these verses at face value, how then, can one explain them without sounding absurd? All of this is to say that each of the soils in the Parable received the word (the seed was sowed and fell on different types of soil), but it was not received the same. Some didn’t receive it at all and the seed was choked up; others received it and “sprouted,” only to be scorched by the sun (Mark 4:5-6); others sprouted and bore much fruit. All got the word, all received the call of the gospel...but not all responded in the right manner. And not all endured for the long-term. When Calvinists assume guaranteed glorification, they negate Jesus’ teaching on the rocky believer. Does this not make Calvinists guilty of creating a “salad-bar theology,” where many pick the parts of Scripture they like and abandon the parts they don’t like or cannot handle? If Jesus’ teaching on the various soils (symbolic for hearers of the Word) means anything, it means that glorification is “certain,” but not “guaranteed.” That is, believers can be positive about the future, but not so presumptuous as to not suffer for Christ’s name. A certain future with Christ should not drive us to neglect anxiously waiting for it with perseverance (Rom. 8:25). There is still a life of faith to be lived if the living believer desires to see God (Hebrews 10:37-39). Hermeneutics plays a great role in many theological debates. It helps, in this case, to be able to distinguish between the philosophical terms of “certainty” and “necessity.” If anything, I hope this post has demonstrated that Calvinists have a hard time reading Scripture: it’s not easy to intentionally overlook apostasy passages and argue the guarantee...but what else can a Calvinist do when the majority of Scripture argues against the Calvinist view?